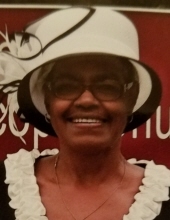 Bernice McCloud Clark, 71, of Quincy, Florida departed this life on Monday, January 29, 2018. Bernice was a very kind, generous, and loving woman with a heart of gold. She was loved by all and she will be deeply missed. She leaves to cherish her precious memories: sons, Barron Keith Clark, Derrick M. Clark, Irvin B. Clark, and Patrick D. Clark; brother, Thenell (Debbie) McCloud; sisters, Bessie Mitchell, Mary (Melvin) Barber, Phoebe (Willie) Baker, and Annie Ree Palmer; host of grandchildren; and a host of other relatives and friends. Visitation will be held on Friday, February 2, 2018, 1-6 PM, at the mortuary. A service of celebration will be held on Saturday, February 3, 2018, 2:00 PM, at Union Chapel African Methodist Episcopal Church, 536 Union Chapel Road, Quincy (Sawdust). Interment: Union Chapel AME Church Cemetery, Quincy (Sawdust). WILLIAMS FUNERAL HOME is providing the service for the Clark family. To plant a tree in memory of Bernice McCloud Clark, please visit our Tribute Store. "Email Address" would like to share the life celebration of Bernice McCloud Clark. Click on the "link" to go to share a favorite memory or leave a condolence message for the family.